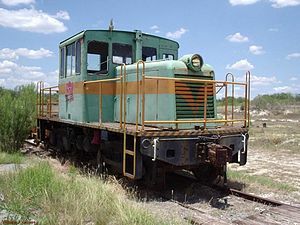 The GE 45-ton switcher is a 4-axle diesel locomotive built by GE between 1940 and 1956. The locomotive was equipped with two 150 hp (110 kW) Cummins diesel engines, each driving a generator which, in turn, drove one of the two traction motors, one per truck. In early models, the second axle on each truck was driven with side rods. Later models had chain drives inside the trucks that served the same purpose. A traditional train air brake was optional, but all came with two compressors (one per engine) and a straight-air independent (locomotive) brake. The cabs were spacious for the size of the locomotive, and both the engineer's seat and the fireman's seat were raised two feet on platforms (under which was the brake equipment, if applicable), so as to afford better views during switching. one per truck. In early models, the second axle on each truck was driven with side rods. Later models had chain drives inside the trucks that served the same purpose. and a straight-air independent (locomotive) brake. (under which was the brake equipment, if applicable), so as to afford better views during switching.